The manufacture of hoisters, columns, straight guide bars, sliding bars, automatic machine, spray molding machine or shaft center of mechanical holding column, etc. 1. Material: the JIS (S45C), SAE 1045 or DIN CK45 bar is treated with heat or high frequency treatment technique, precision center-less grinding and hard chrome plating technique after hard drawn. It is hard, abrasion collision, and corrosion proof. M achining accuracy meets international standards requirements, for the bar's life span is prolonged due to heat treatment. 2. 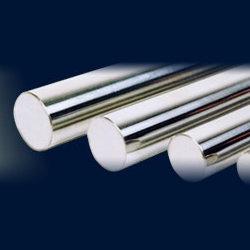 Optional product: high frequency ground medium carbon steel bar. 3. Optional manufacturing processes: heat treatment, center-less grinding and hard chrome plating. 4. Surface hardness: HV 800(minimum) up. 5. Hard chrome thickness: 20 micron. 6. Surface roughness: Ry 0.6~1.4s, Ra 0.2μm~0.4μm. 7. External diameter accuracy: h7, h8, f8. 8. Case depth: 1.5mm~2.5mm. 9. Induction hardness: HRC 55 ± 3.